Bob had never been to Belgium so that was our next destination; on our son's recommendation, we chose Ghent as our base. We decided to stay in this city two nights, which allowed us lots of time to explore. Although our hotel was in a suburban area, we chose to walk towards the centre of the city in order to see more along the way. We made sure to carry our umbrellas; it was to be a rainy day. 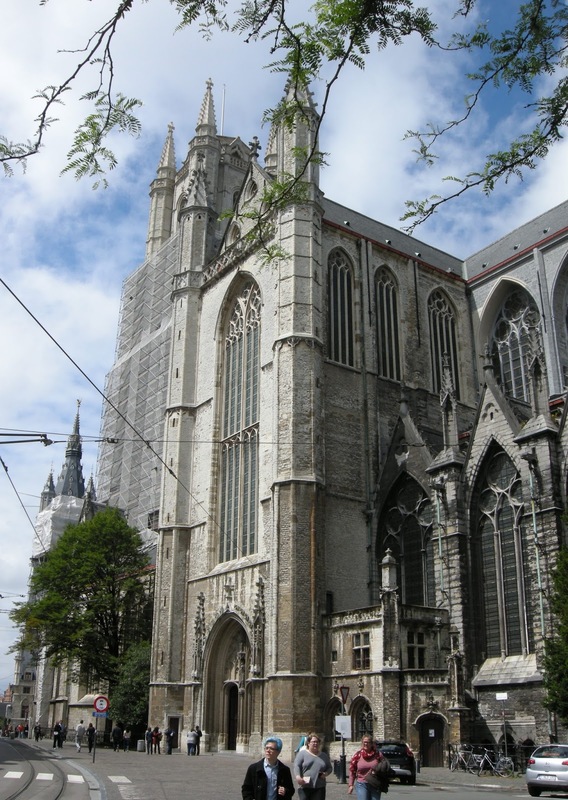 Our path took us past a park and the university, but the first major site we came upon was Sint-Pietersabdij – that is Flemish for Saint Peter's Abbey. 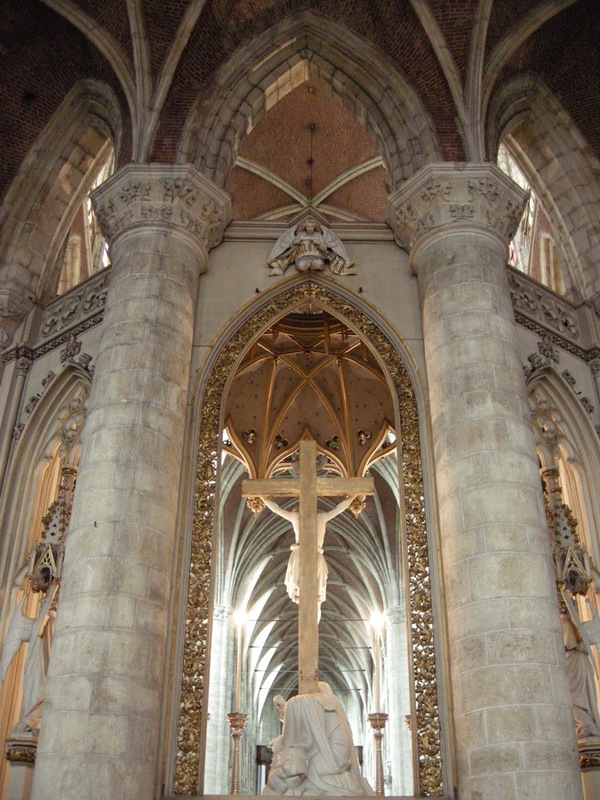 It was an impressive structure in a large square. There are extensive abbey buildings adjacent to it which are now used as museums. The church was a welcome refuge from the persistent rain. 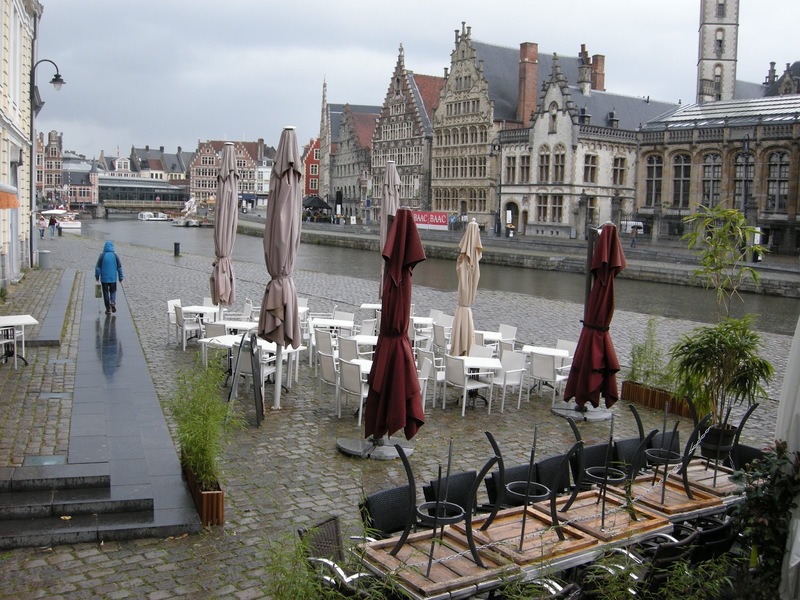 Making the best of a rainy day in Ghent. That is one big leaf beside me! After lunch, the rain stopped and for a short time, we had sunshine and blue skies. 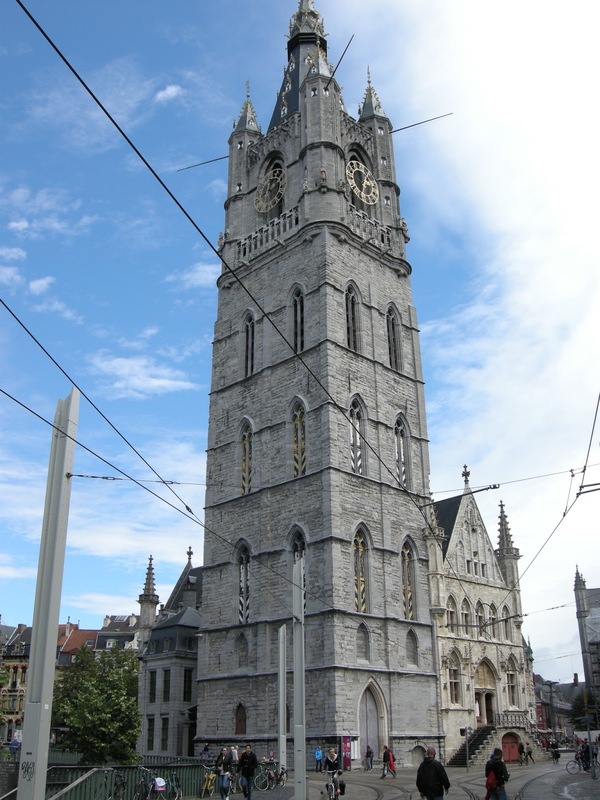 This coincided with our arrival at the Belfry of Ghent, one of the city's three towers. I took advantage of this opportunity to take the lift to the top and look over the town. Begun in the early 14th Century, the Belfry once displayed a gilded dragon at the top of the tower; over the centuries, it has been used to sound warnings for the townspeople and as a watchtower. 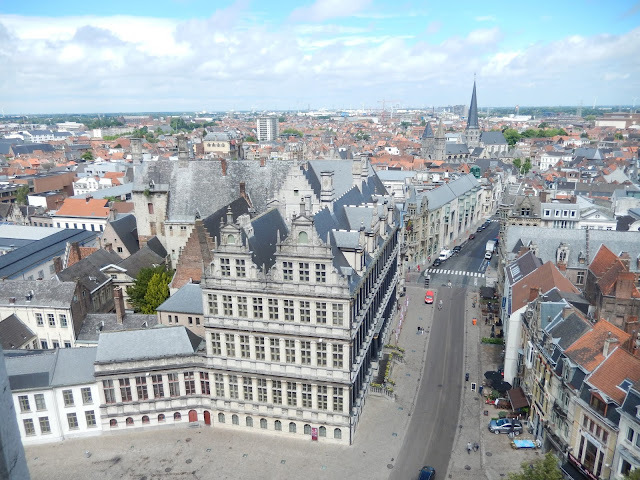 Ghent, as seen from the Belfry. 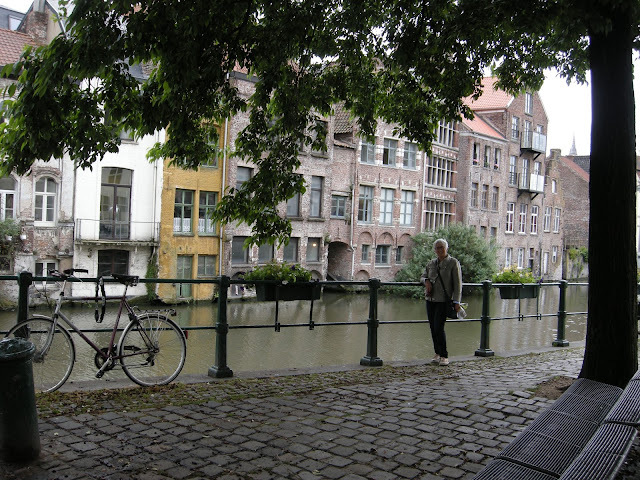 Below me, Bob captured the beauty of this corner of the city. 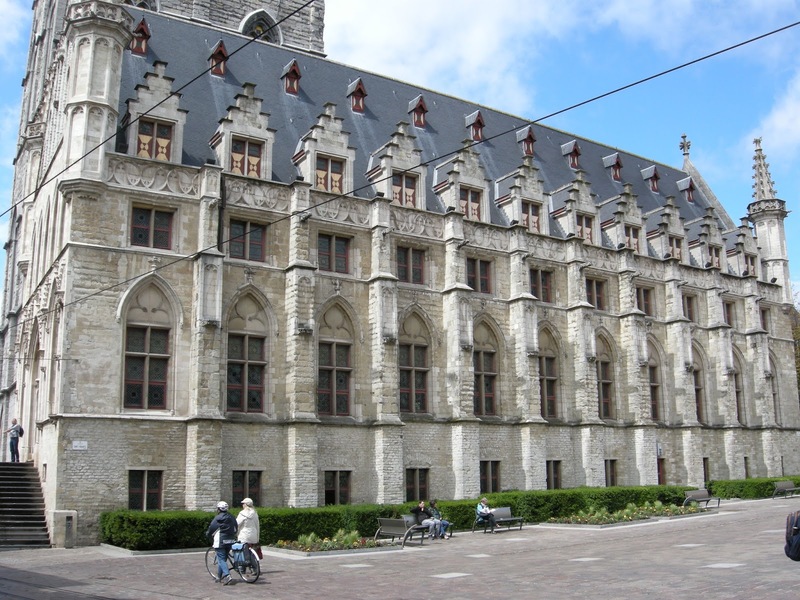 This part of Ghent is a UNESCO World Heritage site. 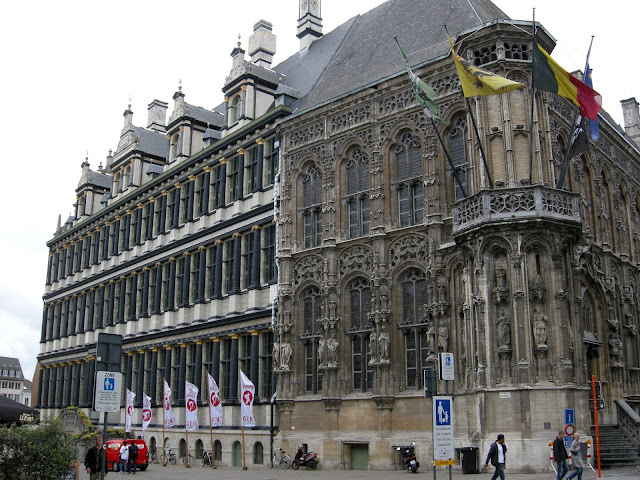 Each of the major buildings is absolutely beautiful. Rear view of Saint Nicholas Church. We ended our walking tour here. 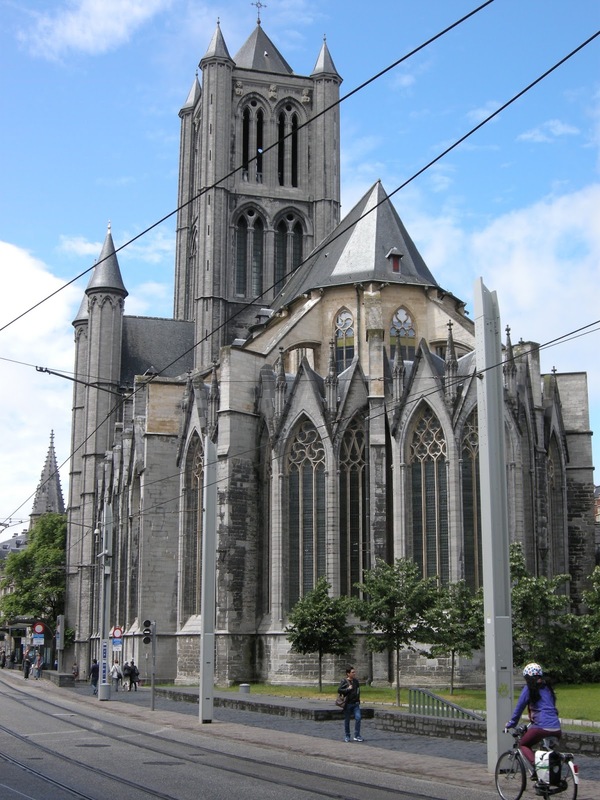 The Belfry lies between St. Nicholas Church and Saint Bavo's Cathedral. 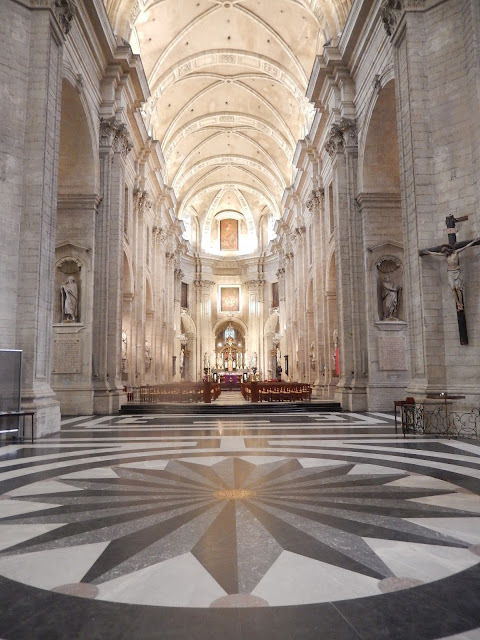 These grand buildings vied for Bob's attention, as he tried to snap them from every angle. 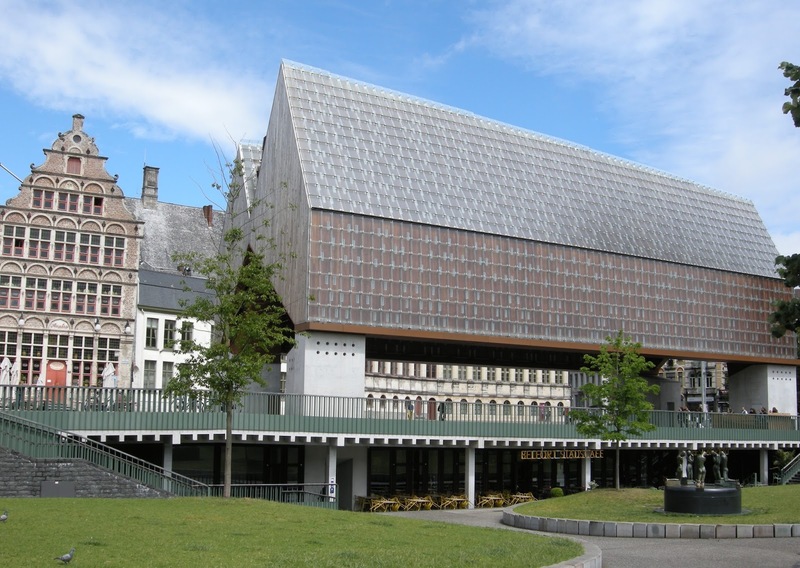 Not to be ignored in the same area were the modern and unique Pavilion building and the Royal Dutch Theatre which stands between the Belfry and the Cathedral. 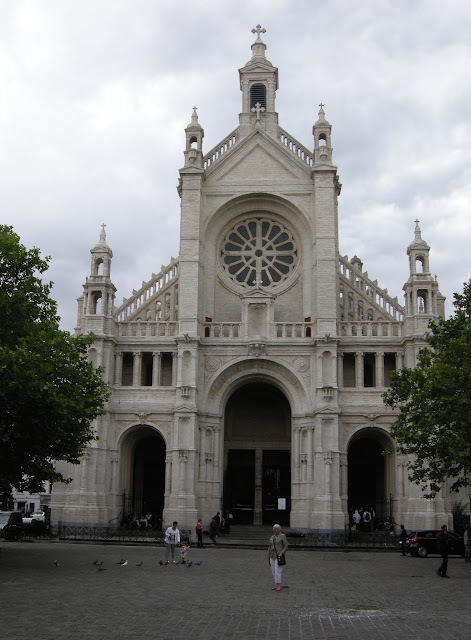 A side view of the Cathedral. 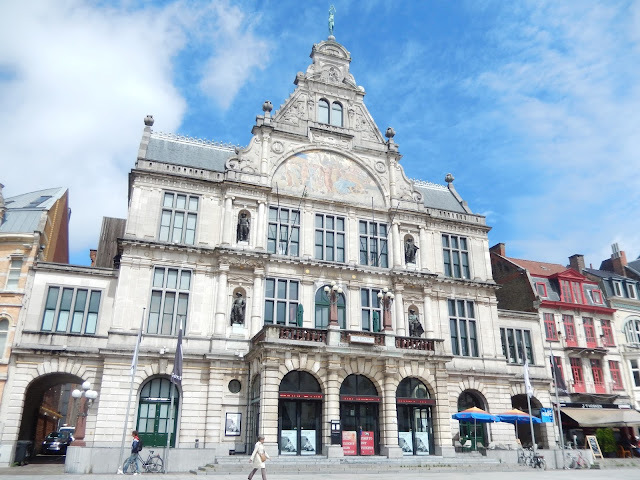 The facade was under scaffolding. 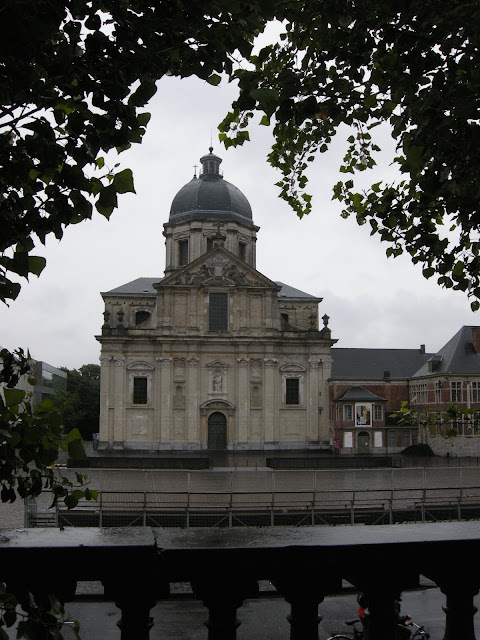 As we continued our tour of the city, the skies became overcast again, but the rain held off for another hour or so. Really, we were lucky to see almost all the major sights before a late afternoon downpour. One of the towers of the school of the arts. 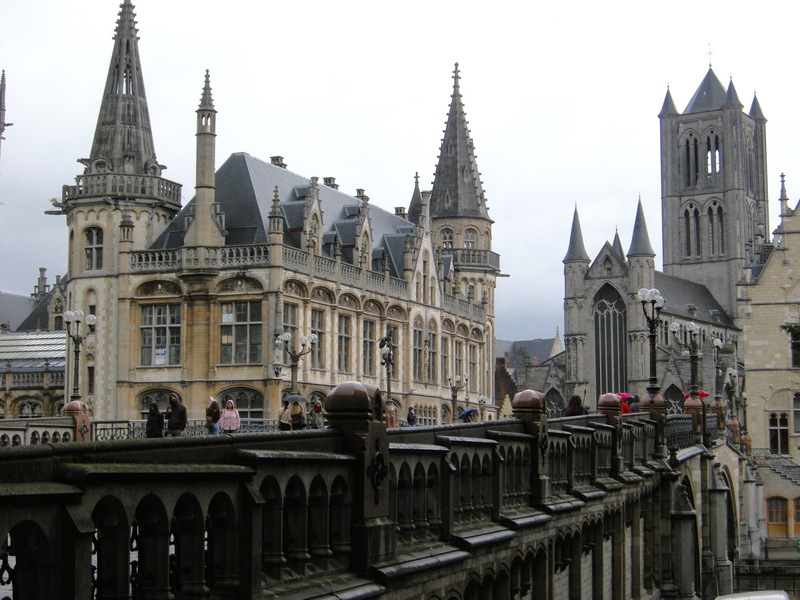 Ghent's architecture is fascinating. The city hall, for instance, is part Renaissance and part flamboyant gothic; not far away, the school of the arts is dominated by two circular towers. Jacob and I point towards England. 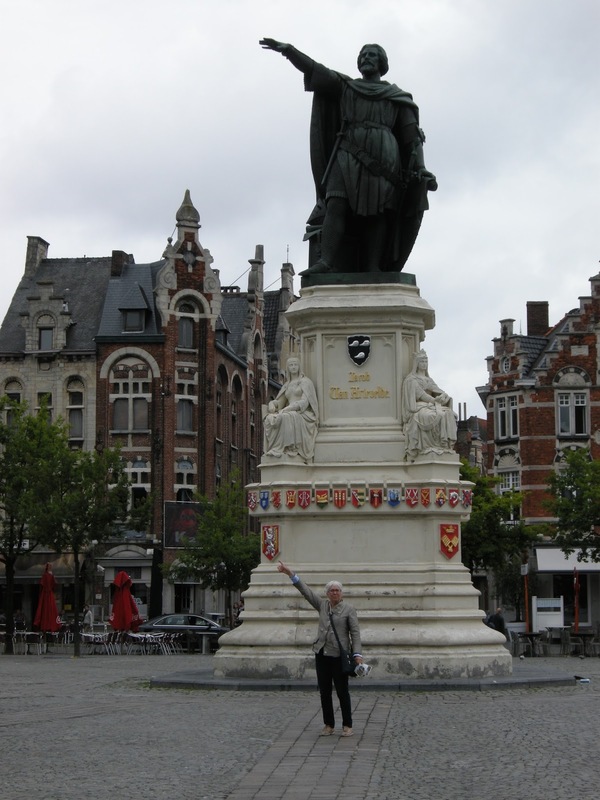 In a large square, we came across the statue of Jacob van Artevede. He had advocated for the recognition of Edward III in the 14th Century and has been immortalized pointing towards England ever since. 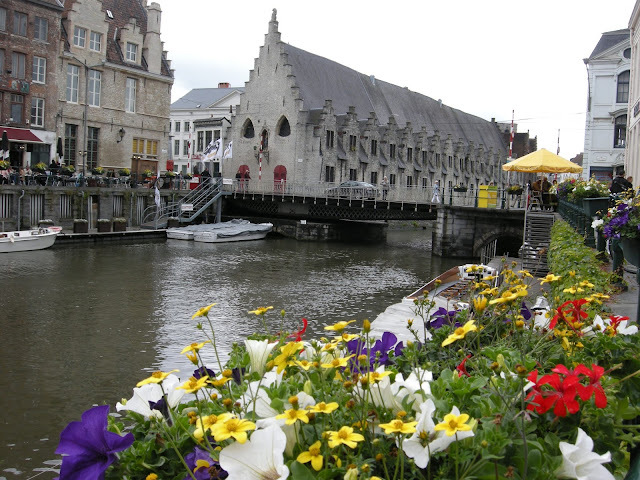 Eventually, we arrived in the canal area of Ghent where I was reminded of another beautiful Belgian city, Bruges. In spite of the weather, some tourists had opted to see the city from canal boats below us. A particularly lovely sight was the Great Butcher's Hall near a bridge. 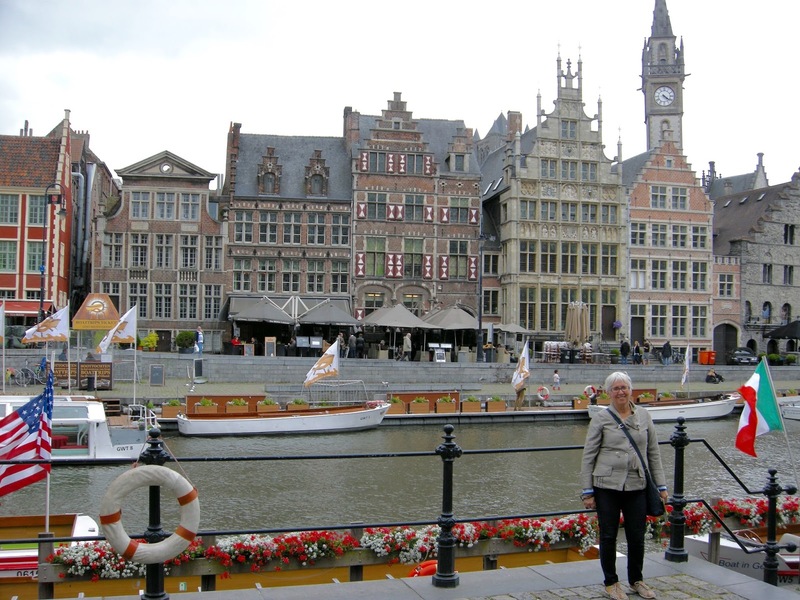 In this square next to the castle is a statue with a dog on the top. I like his paper hat. Very close by is the Castle of the Counts. 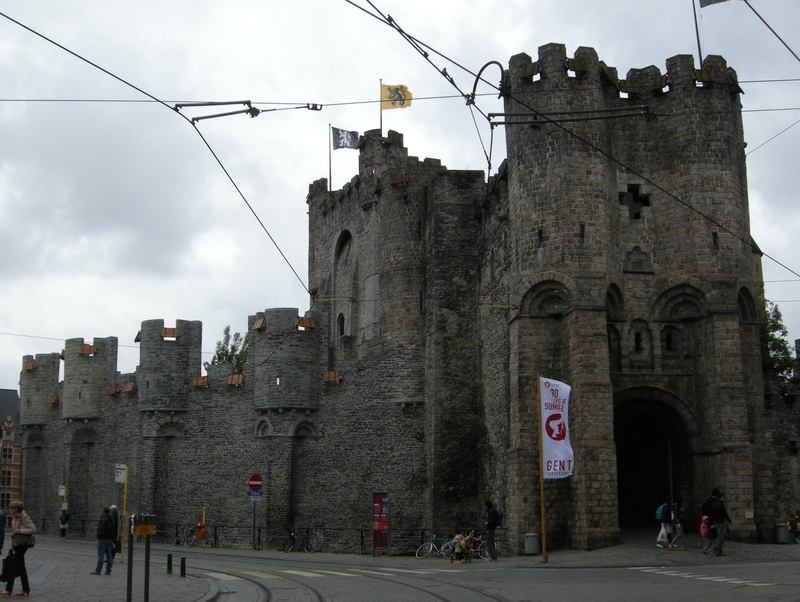 This fortress sits in the middle of the city, rather than where castles are supposed to be – on a promontory above everything. 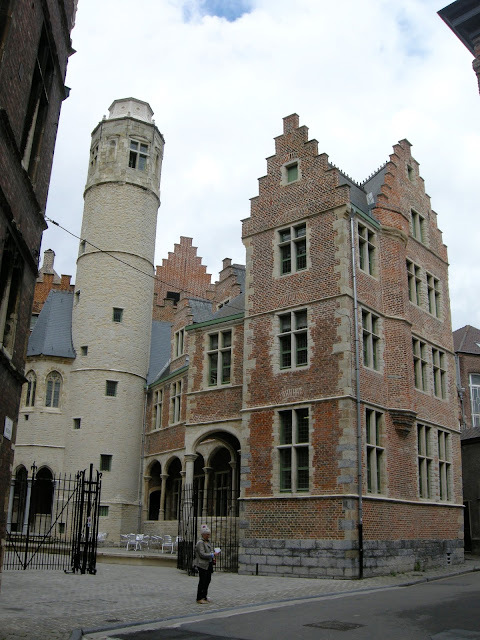 Along the Graslei canal are Ghent's former guildhouses - with beautiful stepped façades. Even under threatening skies these were lovely to look at. At about this time, the skies opened up. 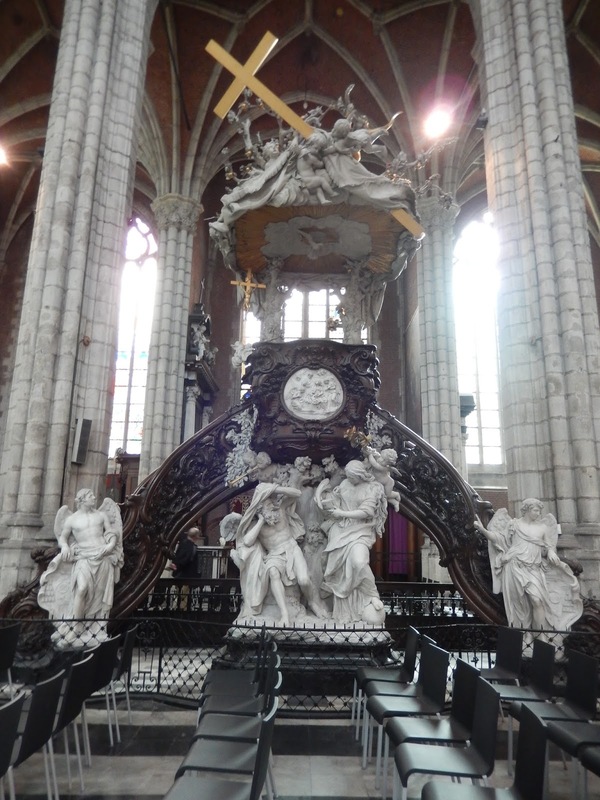 Fortunately, the last two sites we had yet to visit were churches, St. Michael's and St. Nicholas'. We were more than happy to duck inside, but we got very wet as we dashed between them. Our tour over, the rain was so heavy that we decided to take the tram back to the neighbourhood of our hotel, When we arrived at the train station, we were amazed at the sea of bikes parked there. 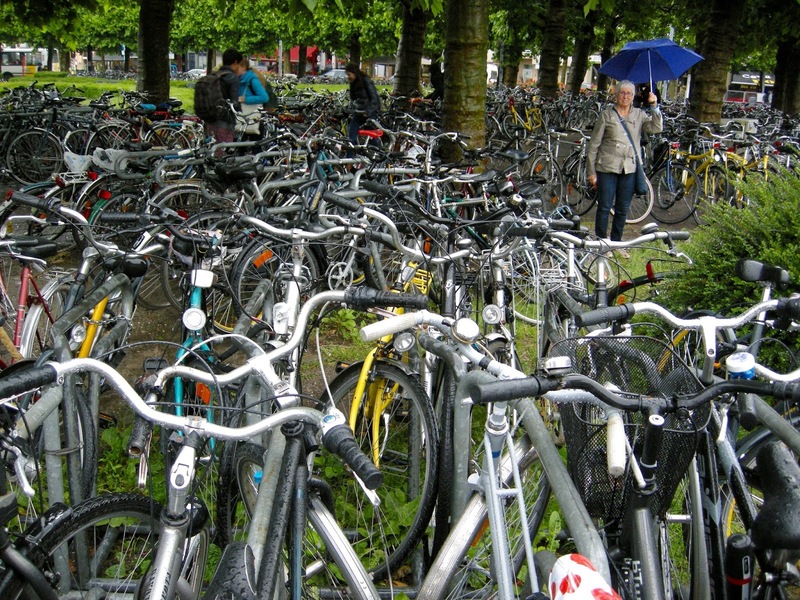 I love that Europeans often prefer the bike to the car as personal transport. There would have been some very wet people that evening though. Due the the weather, we spent our evening close to our hotel - we found a delicious Thai restaurant a mere 100 meters away - and prepared for an early departure the next morning. The Atonium structure in Brussels Park. 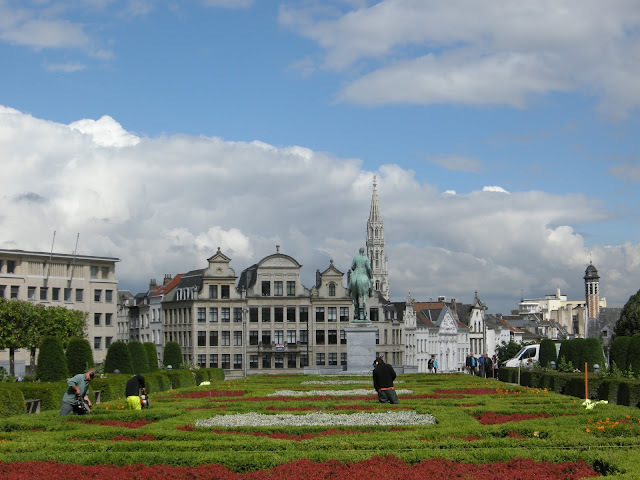 We headed south to Brussels, a mere 30 minutes away. However, we soon discovered that, without a map, it was not easy to find our way to the centre of this city, even with a GPS, so when we saw some silver balls in the distance, we headed in that direction. 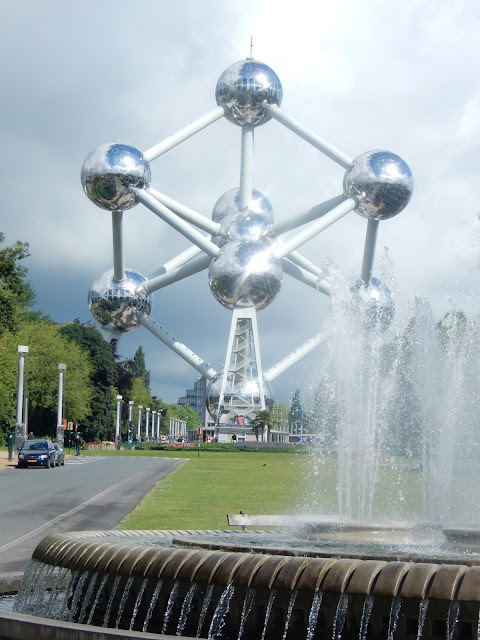 This was the Atomium, constructed for the Brussels World's Fair in 1958. There, some very nice men programmed an address into our GPS and off we went. View towards the old city from the Art Gallery garden. 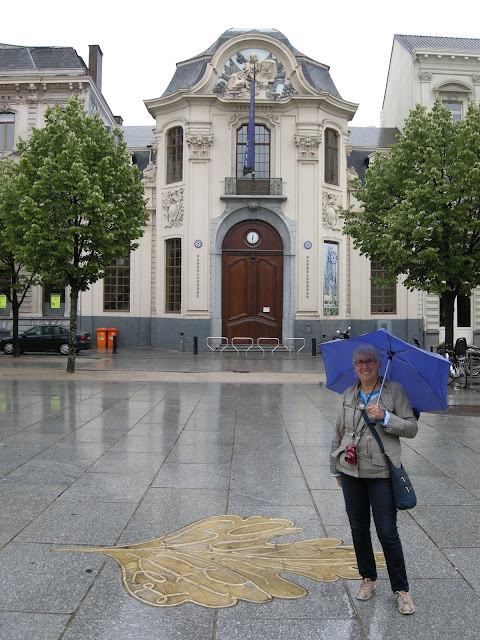 Emerging from the underground parking, I immediately recognized where we were - very close to the art gallery and the Royal Palace. Thus oriented, we began our walking tour of Belgium's capital. Over the next three hours or so, we saw more of the city than I had seen in my previous visit in November when our school group had stopped there for a few hours. 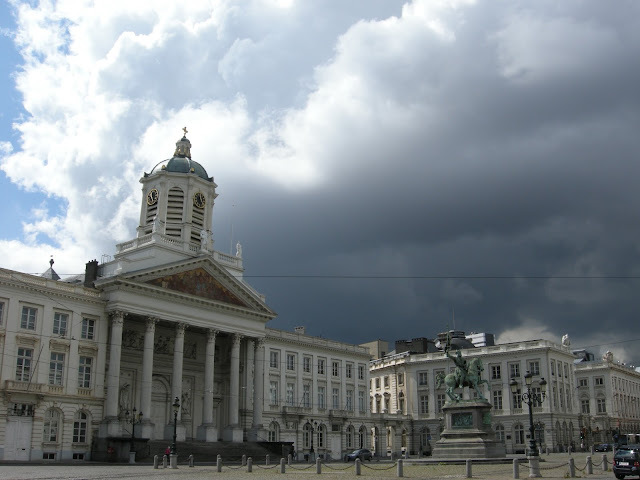 Even though the skies were threatening at times, we never experienced any rainfall. 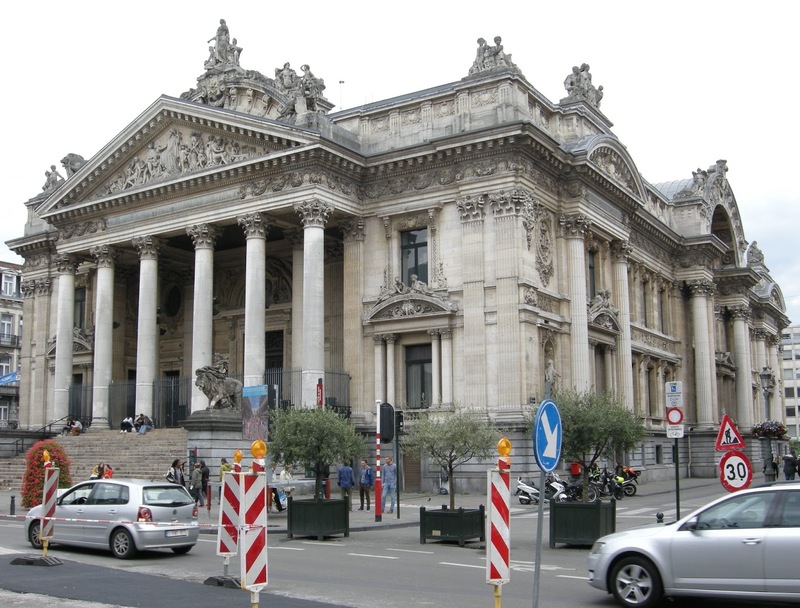 Our excursion around Brussels led us to Saint-Catherine's Church in the old part of the city; we also passed the "bourse", (the stock market building), an ornate building erected in the latter half of the 19th century. 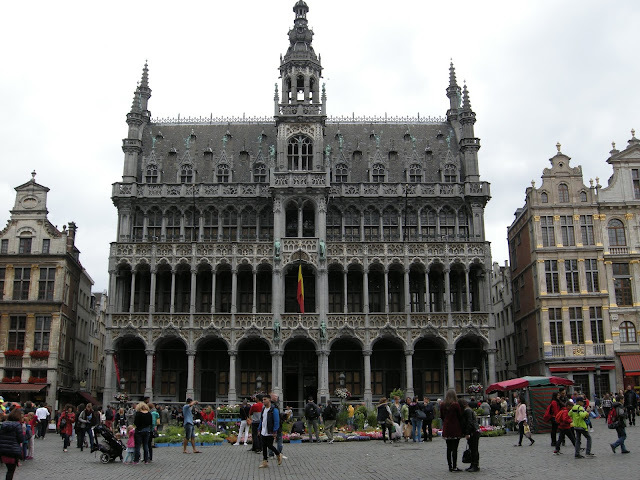 Of course, we eventually ended up in Grand Place, the square where all the tourists seem to go. And why not? 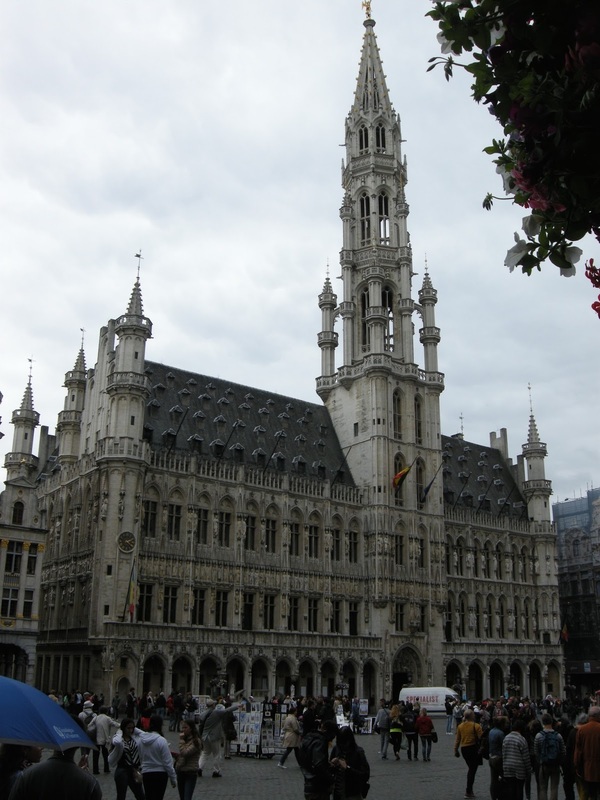 The town hall and the museum of Brussels are both remarkably beautiful buildings. 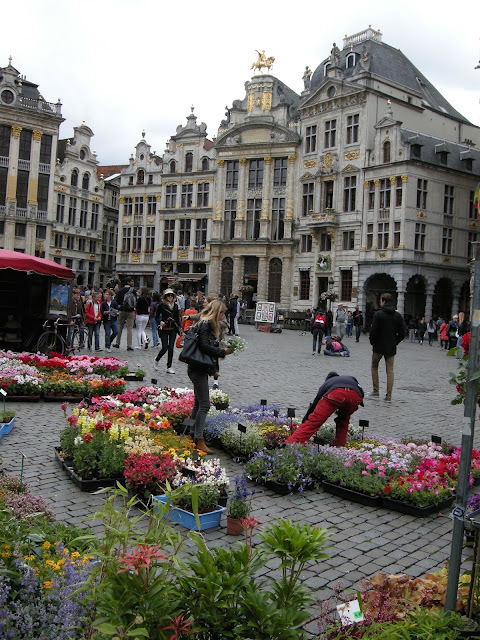 On this day, there were flower sellers adding colour to the scene; this was a hint of what will happen in August when the centre of the square will be covered by a floral carpet. 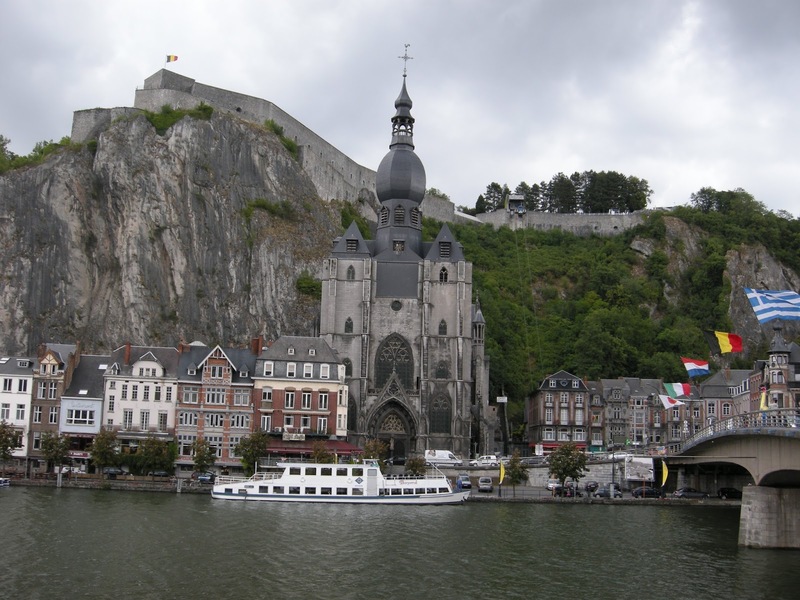 We had one more stop in Belgium planned, so we hit the road again by mid-afternoon to make our way to a beautiful Belgian village, Dinant. We had seen images online of the 12th century citadel perched above the town, and wanted to take pictures of our own of this site. Dinant's citadel sits above the town. When we arrived, we were surprised at the traffic. 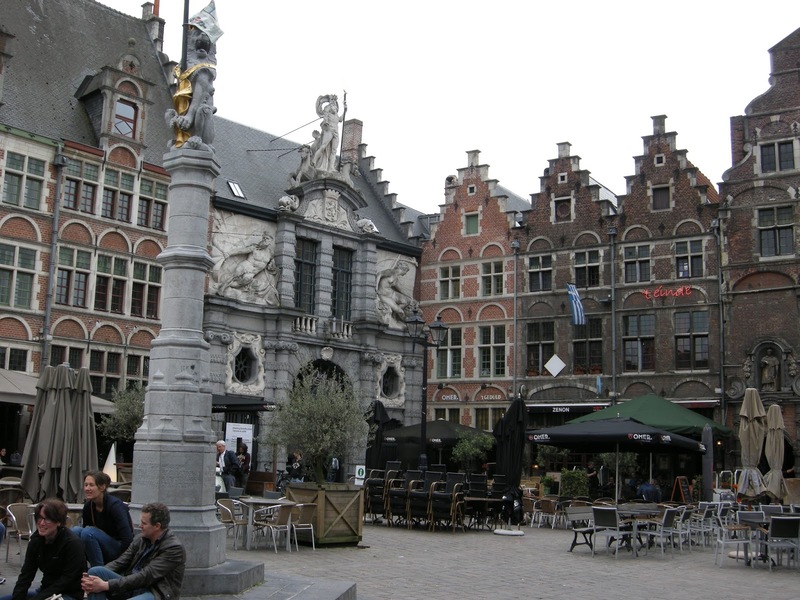 "Did Dinant have a rush hour? ", we thought. To avoid the slow down, we parked away from the centre of town and decided to explore on foot, rather than ascend in the car to the opposite of the citadel for the best perspective. 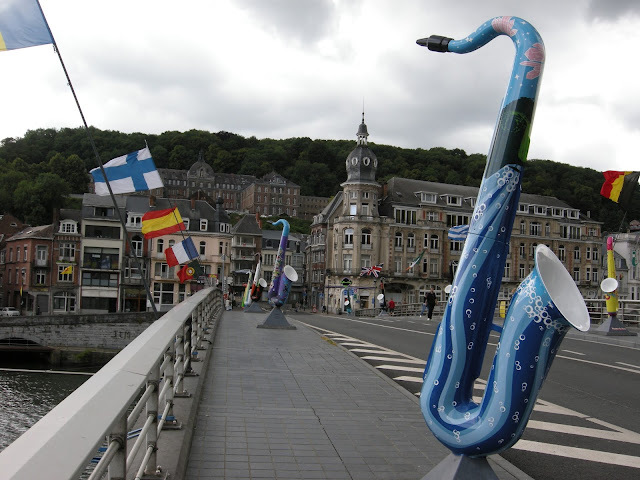 The bridge across the Meuse river was festooned with giant and very colourful saxophones. At the base of each one was the name of a country. 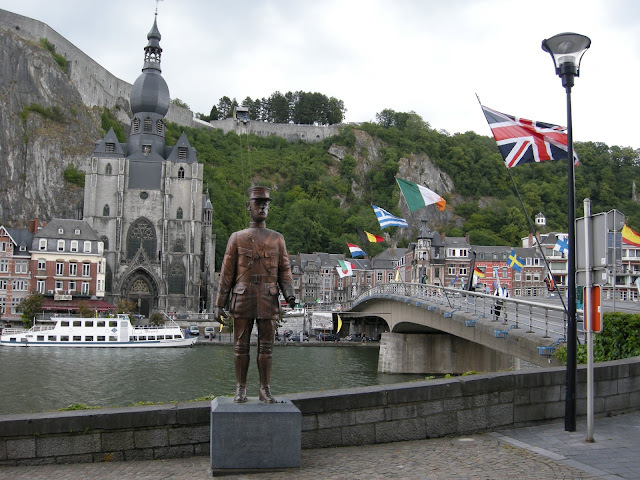 This is the "Bridge of the Sax" to honour the inventor of the instrument, Adolphe Sax, a Dinant native. Charles de Gaulle, hero of Dinant. When we reached the other side, there was a statue of Charles de Gaulle, a tribute to his role as a lieutenant in the WWI Battle of Dinant. He was injured there, but the Belgians are thankful for his contribution to the defence of their town in 1914. This would be our last stop in Belgium. A new country awaited us.